Not to be confused with a former professional wrestler who used the ring names Dutch Savage and Dutch Schultz. Dutch Schultz (born Arthur Simon Flegenheimer; August 6, 1902 – October 24, 1935) was a New York City-area German Jewish-American mobster of the 1920s and 1930s who made his fortune in organized crime-related activities, including bootlegging and the numbers racket. Weakened by two tax evasion trials led by prosecutor Thomas Dewey, Schultz's rackets were also threatened by fellow mobster Lucky Luciano. In an attempt to avert his conviction, Schultz asked the Commission for permission to kill Dewey, which they refused. When Schultz disobeyed them and made an attempt to kill Dewey, the Commission ordered his murder in 1935. Schultz was born to German Jewish immigrants Herman and Emma (Neu) Flegenheimer, who had married in Manhattan on November 10, 1900. He had a younger sister, Helen, born in 1904. 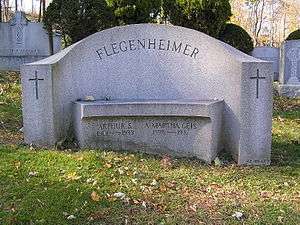 Herman Flegenheimer apparently abandoned his family, and Emma is listed as divorced in the 1910 census. (In her 1932 petition for U.S. citizenship, however, she wrote that her husband had died in 1910.) The event traumatized Schultz, and he always denied his father had left them. Schultz would drop out of school in the 8th grade to help support himself and his mother. From 1916 to 1919, he worked as a feeder and pressman for the Clark Loose Leaf Company, Caxton Press, American Express, and Schultz Trucking in the Bronx. He then worked at a neighborhood night club owned by a minor mobster, and began robbing craps games before turning to burglary. Schultz was caught breaking into an apartment and sent to the prison on Blackwell's Island (now called Roosevelt Island). A photograph of Schultz at age 18, during his incarceration, was published in the 2010 book New York City Gangland. The prison staff soon found their new prisoner to be unmanageable and transferred him to the work farm in Westhampton, New York. He managed to escape, but was recaptured and two months were added to his sentence. He was paroled December 8, 1920. Flegenheimer went back to work at Schultz Trucking and was soon associating with known criminals. When they asked his name, he told them he was "Dutch" Schultz. (Dutch is a corruption of "Deutsch", and does not refer to the inhabitants of the Netherlands.) With the enactment of Prohibition, Schultz Trucking began smuggling liquor and beer into New York City from Canada. After an argument, Dutch left Schultz Trucking to work for Schultz's Italian competitors. In 1928, a gangster named Joey Noe opened the Hub Social Club, a small speakeasy, and hired Schultz to work as a bouncer. Schultz earned a reputation for brutality when he lost his temper. Impressed by his ruthlessness, Noe made him a partner. Noe and Schultz soon opened more operations. To avoid the high delivery costs, they bought their own trucks. Frankie Dunn, a Union City, New Jersey, brewery owner, supplied their beer. Schultz rode shotgun to protect the beer trucks from hijackers. The Rock brothers, who already controlled an operation in the Bronx, refused to buy from Noe and Schultz. However, the Rock brothers underestimated the newcomers. Eventually, the elder brother, John Rock, agreed to cooperate, but younger brother Joe refused. One night the Noe-Schultz gang kidnapped him. They beat him and hung him by his thumbs from a meat hook and then allegedly wrapped a gauze bandage smeared with discharge from a gonorrhea infection over his eyes. His family reportedly paid $35,000 and he was released. Shortly after his return, he went blind. From then on, the Noe-Schultz gang met little opposition as they expanded to control the beer supply for the entire Bronx. Like other organized crime figures, Schultz became wealthy during Prohibition. He was defended by the prominent attorney James Noonan from Albany, where he was acquitted of tax evasion. According to American journalist Selwyn Raab, the Noe-Schultz operation, which had begun to flourish in the Bronx, became the only non-Italian gang able to rival those who would become the heads of the Mafia's Five Families. It now expanded over to Manhattan's Upper West Side into the neighborhoods of Washington Heights, Yorkville, and Harlem. Schultz and Noe moved their headquarters from the Bronx to what is said to have been East 149th Street in Manhattan; however, the gang's move now brought them into direct competition with Irish-American gangster Jack "Legs" Diamond. A full-scale war soon broke out between the rival gangs. Early in the morning of October 16, 1928, Noe was gunned down outside of the Chateau Madrid on 54th Street. He managed to get off several shots, although he was seriously wounded. Witnesses reported seeing a blue Cadillac bounce off a parked car and lose one of its doors before speeding away. When police recovered the car an hour later, they discovered in the back seat the body of Louis Weinberg (no relation to Schultz gang members Abraham "Bo" Weinberg and George Weinberg). Noe's wounds led to an infection, which he died of on November 21. Schultz was crushed by the loss of his friend and mentor. A few weeks after the Chateau Madrid ambush, Arnold Rothstein was found fatally wounded near a service entrance to the Park Central Hotel. While the most common theory was that George "Hump" McManus killed Rothstein over a bad gambling debt, many believed that Schultz had ordered the hit in retribution for Noe's death. Supporting this is the fact that the first person McManus called after killing Rothstein was Schultz's attorney, Dixie Davis. After the call to Davis, Bo Weinberg picked up McManus and drove him away from the murder scene. McManus was later cleared of the killing. In October 1929, Legs Diamond and his mistress were dining in their pajamas in her suite at the Hotel Monticello. Gunmen broke down the door and sprayed the room with machine gun fire, hitting Diamond five times. He recovered from his wounds, and left New York for a lengthy stay in Europe. During his absence, his gang was forced to relocate outside the city. When he returned home, Diamond began carving out a new territory for himself in Albany. After surviving several more attempts on his life, Diamond was finally killed either by the Albany police or other Irish gangsters in December 1931. Unique among the major gangs in organized crime, Schultz gang members received a flat salary instead of the customary percentage of the take from any operations in which they were involved. In 1930, one of Schultz's enforcers, Vincent Coll, decided that this arrangement was unacceptable and demanded to be made a partner instead. When Schultz refused, Coll formed his own crew with the ultimate goal of murdering Schultz and taking over his territory. During the bloody conflict that followed, Coll lost his older brother Pete and earned the nickname "Mad Dog" from the press after a child was killed during a botched assassination committed by his gang. In February 1932, the Schultz gang lured Coll into a trap. While Coll was talking in a drugstore phone booth, gunmen burst into the store and machine-gunned him to death. The killers may have included Fats McCarthy and the Weinberg brothers. With the end of Prohibition, Dutch Schultz needed to find new sources of income. His answer came with Otto "Abbadabba" Berman and the Harlem numbers racket. The numbers racket, the forerunner of "Pick 3" lotteries, required players to choose three numbers, which were then derived from the last number before the decimal in the handle at the racetrack. Berman was a middle-aged accountant and math whiz who let Schultz fix this racket. In a matter of seconds, Berman could mentally calculate the minimum amount of money Schultz needed to bet at the track at the last minute in order to alter the odds. This strategy ensured that Schultz always controlled which numbers won, guaranteeing a larger number of losers in Harlem and a multimillion-dollar-a-month tax-free income for Schultz. Berman was reportedly paid $10,000 a week for his valued insight. Along with the policy rackets, Schultz began extorting New York restaurant owners and workers. Using strong-arm tactics such as beatings and stink bomb attacks, Schultz merged all the local unions under his Metropolitan Restaurant & Cafeteria Owners Association. A hulking gangster named Jules Modgilewsky, also known as Julie Martin, served as Schultz’s point man in this operation. Martin successfully extracted thousands of dollars of tributes and "dues" from the terrified restaurant owners. As Martin contorted on the floor, Schultz apologized to Davis for killing someone in front of him. When Davis later read a newspaper story about Martin's murder, he was shocked to find out that the body was found on a snow bank with a dozen stab wounds to the chest. When Davis asked Schultz about this, the boss dead-panned, "I cut his heart out." At the time of the Martin killing, Schultz was busy fighting a federal tax evasion case; U.S. Attorney Thomas Dewey had set his sights on convicting Schultz. Schultz was convicted of the charges, but they were soon overturned. Schultz's lawyers convinced the judge that their client could not get a fair retrial in New York City, so the judge moved it to the small town of Malone in rural upstate New York. Looking to influence potential jurors, Schultz presented himself to the town as a country squire and good citizen. He donated cash to local businesses, gave toys to sick children, and performed other charitable deeds, a strategy that proved successful. In the late summer of 1935, to everyone's surprise, Schultz was acquitted of tax evasion. Following his acquittal in the second trial, the outraged mayor of New York, Fiorello La Guardia, issued an order that Schultz be arrested on sight should he return to New York. As a result, Schultz was forced to relocate his base of operations across the Hudson River to Newark. As the legal and related costs of fighting his tax indictment continued to mount, Schultz found it necessary to cut the commissions of his runners and controllers in order to bolster the "Arthur Flegenheimer Defense Fund." He reduced pay from around 50 percent down to 10 percent for the runners and to 5 percent for the controllers. However, Schultz's poverty plea fell on universally deaf ears, even after his associates began making threats of violence if any serious resistance developed. The runners and controllers hired a hall, held a mass protest meeting, and declared a strike of sorts. Suddenly, fewer and fewer bets were being delivered to the banks, reducing the vast policy inflow to a mere trickle as Schultz's street soldiers lost their zeal. Schultz was forced to back down and restore the status quo, but he had already permanently damaged his relationships with his underlings. Bo Weinberg, concerned that the drain of money from Schultz’s rackets into his legal defense fund was going to ruin the business for everyone else, sought advice from New Jersey mobster Longy Zwillman, who in turn put him in contact with Charlie "Lucky" Luciano. Weinberg was hoping to make a deal whereby he would retain overall control and a percentage, but Luciano instead planned to divide the Schultz empire among his associates, which was to take place in the event of Schultz's being convicted. Believing that Schultz would be convicted in the second trial, Luciano and his allies implemented their plan to move in on his empire. Given the circumstances of his takeover of the policy racket, the bad feeling created by his attempted pay cuts, and the complicity of Weinberg, his number one enforcer, the takeover would have met with little resistance. Schultz quickly sought a meeting with Charlie Luciano, his erstwhile colleague on the Commission, in order to "clarify" the situation. Schultz even converted to Roman Catholicism to cozy up to Luciano. Luciano placated Schultz with the explanation that they were just "looking after the shop" while he was away, only to ensure that everything ran smoothly, and promised that control of his rackets would be returned. In a weakened position and still under constant harassment from the authorities, Schultz was forced to accept Luciano's version of events. However, Luciano was well aware of Schultz's prior history and would have had no illusions about what the outcome would be in the long term—that as soon as he felt able, Schultz would launch an all-out war to recover what he had lost and get revenge. As for Weinberg, he disappeared without a trace, and it was believed that Schultz had arranged the disappearance. Gangland legend has it that, still suspicious of Luciano after the Weinberg betrayal, Schultz soon went before an emergency meeting of the Mafia Commission and asked permission to kill his enemy, U.S. Attorney Thomas Dewey. While some Commission members, including Albert Anastasia and Jacob Shapiro, supported Schultz's proposal, the majority were against it on the basis that the full weight of the authorities would come down on them if they murdered Dewey, and they voted unanimously against the proposal. Bonanno family boss Joseph Bonanno thought the idea was "insane." Schultz was furious at the vote, accusing the Commission of trying to steal his rackets and "feed him to the law." Schultz left in a rage, and the Commission decided to kill him to stop the Dewey hit. Calabrian immigrant Albert Anastasia was ordered to arrange Schultz's elimination, and he sent Jewish mobster Louis Buchalter to handle it. At 10:15 p.m. on October 23, 1935, Dutch Schultz was shot at the Palace Chophouse at 12 East Park Street in Newark, New Jersey, which he used as his new headquarters. Two bodyguards and Schultz's accountant were also killed. Schultz was in the men's room when Charles Workman and Emanuel "Mendy" Weiss, two hitmen working for Buchalter's Murder, Inc., entered the establishment. Accounts vary as to what happened next, specifically regarding the order in who killed Schultz and his men. Workman's later account of entering the bathroom to find Schultz either urinating or washing his hands suggests he managed to slip past Schultz's men and that Schultz was either shot first or else Workman and Weiss opened fire at the same time. Workman fired at Schultz twice. One bullet struck him slightly below his heart, and ricocheted through his abdomen before exiting the small of his back. Schultz collapsed onto the floor, and Workman joined Weiss in the back room of the restaurant. Both men then fired several times at Schultz's gang members: Otto Berman, Schultz's accountant; Abe Landau, Schultz's chief henchman; and Schultz's bodyguard, Bernard "Lulu" Rosencrantz. Berman collapsed immediately after being shot. Landau's carotid artery was severed by a bullet passing through his neck, while Rosencrantz was hit repeatedly at point blank range with 00 lead buckshot. Nevertheless, both men rose to their feet and returned fire, driving the assassins out of the restaurant. Weiss jumped into the getaway car and ordered the driver to abandon Workman. Landau chased Workman out of the bar and emptied his pistol at him, though he missed. Workman fled on foot, and Landau finally collapsed onto a nearby trash can. Shortly after Workman fled, Schultz staggered out of the bathroom, clutching his side, and sat at his table. He called for anyone who could hear him to get an ambulance. Rosencrantz, who had collapsed while chasing Workman, rose to his feet and demanded the barman (who had hidden during the shootout) give him five nickels in exchange for his quarter. Rosencrantz called for an ambulance before he lost consciousness. When the ambulance arrived, medics determined Landau and Rosencrantz were the most seriously wounded of the men and took to the hospital immediately. A second ambulance was called for to take Schultz and Berman. Berman was unconscious, but Schultz was drifting in and out of lucidity, as police attempted to comfort him and get information. Because the medics had no pain relievers, Schultz was given brandy to relieve his suffering. When the second ambulance arrived, Schultz gave one of the medics $10,000 in cash to see that he received the best treatment. After surgery, when it looked as if Schultz would live, the medic was so worried that he would be indebted to the mobster for keeping the money that he shoved the money back in bed with Schultz. Otto Berman, the oldest and least physically fit of the four men, was the first to die, at 2:20 that morning. At the hospital, Landau and Rosencrantz waited for surgery and refused to say anything to the police until Schultz arrived and gave them permission; even then, they provided the police with only minimal information. Abe Landau died of exsanguination eight hours after the shooting. Meanwhile, Rosencrantz was taken into surgery; the doctors, incredulous that Rosencrantz was still alive despite voluminous blood loss and ballistic trauma, were unsure of how to treat him. He survived for 29 hours after the shooting before succumbing to his injuries. Before Schultz went to surgery, he received the last rites from a Catholic priest at his request. During his second trial, Schultz decided to convert to Catholicism and had been studying its teachings ever since, convinced that Jesus had spared him prison time. Doctors performed surgery but were unaware of the extent of damage done to his abdominal organs by the ricocheting bullet. They were also unaware that Workman had intentionally used rust-coated bullets in an attempt to give Schultz a fatal bloodstream infection (septicemia) should he survive the gunshot. Schultz lingered for 22 hours, speaking in various states of lucidity with his wife, mother, a priest, police, and hospital staff, before dying of peritonitis. Although Schultz's empire was meant to be crippled, several of his associates survived the night. Martin "Marty" Krompier, whom Schultz left in charge of his Manhattan interests while he hid in New Jersey, survived an assassination attempt concurrent with the Palace Chophouse shooting, and no apparent attempt was made on the life of Irish-American mobster John M. Dunn, who later became the brother-in-law of mobster Edward J. McGrath and a powerful member of the Hells Kitchen Irish mob. Charles Workman was eventually convicted of Schultz's murder and sent to Sing Sing to serve a 23-year sentence. Upon his arrival, Workman requested to see Warden Lewis Lawes. Workman wanted to be housed in the same cell block as several of his old friends who were incarcerated there; his request was not granted. Emmanuel Weiss was electrocuted for an unrelated killing in 1944 on the same evening as Louis "Lepke" Buchalter. A boy has never wept...nor dashed a thousand kim. You can play jacks, and girls do that with a soft ball and do tricks with it. Oh, Oh, dog Biscuit, and when he is happy he doesn't get snappy. One of his last utterances was a reference to "French Canadian bean soup" (French Canadian pea soup is a popular dish that is still produced as canned goods by many food companies). Schultz's last words inspired a number of writers to devote works related to them. Beat Generation author William S. Burroughs published a screenplay in novel form titled The Last Words of Dutch Schultz in the early 1970s, while Robert Shea and Robert Anton Wilson connected Schultz's words to a global Illuminati-related conspiracy, making them a major part of 1975's The Illuminatus! Trilogy. (In Wilson's and Shea's story, Schultz's ramblings are a coded message.) In his 1960 anthology Parodies, Dwight Macdonald presents Schultz's last words as a parody of Gertrude Stein. In the novel Billy Bathgate, the protagonist used clues from Schultz's deathbed ramblings to locate his hidden money. After Schultz's death, it was discovered that he and his wife had never gone through an official marriage ceremony, and the possible existence of another wife emerged with the discovery of letters and pictures of another woman and children among his effects at the hotel where he was staying in Newark. This was never resolved, as his common-law wife refused to talk about it and the mystery woman never came forward. Two other women also called at the morgue to receive his effects, but their identities were never established. Though he was estimated to be worth $7 million when he died, no trace of the money was ever found. By receiving last rites, Schultz was guaranteed interment in Gate of Heaven Cemetery in Hawthorne in Westchester County, New York, although, at the request of his Orthodox Jewish mother, Schultz's body was draped with a talit, a traditional Jewish prayer shawl. Several actors have played Dutch Schultz in films: Vic Morrow in Portrait of a Mobster (1960), Vincent Gardenia in Mad Dog Coll (1961), James Remar in The Cotton Club (1984), Dustin Hoffman in Billy Bathgate (1991), Bruce Nozick in Hit the Dutchman (1992), Lance Henriksen in The Outfit (1993), and Tim Roth in Hoodlum (1997). In the 1959 The Untouchables episode "The Dutch Schultz Story", Schultz was played by Lawrence Dobkin. The building that housed the Palace Chop House was torn down in 2008. Shortly before his death, fearing that he would be incarcerated as a result of Dewey's efforts, Schultz commissioned the construction of a special airtight and waterproof safe, into which he placed $7 million in cash and bonds. Schultz and Rosencrantz then drove the safe to an undisclosed location somewhere in upstate New York and buried it. At the time of his death, the safe was still interred; as no evidence existed to indicate that either Schultz or Rosencrantz had ever revealed the location of the safe to anyone, the exact place where the safe was buried died with them. Gangland lore held that Schultz's enemies spent the remainder of their lives searching for the safe. The safe has never been recovered. Treasure hunters meet annually in the Catskills to search for the safe. One such meeting was documented in the documentary film Digging for Dutch: The Search for the Lost Treasure of Dutch Schultz. 1 2 3 4 5 6 7 8 9 10 11 12 13 The Five Families. MacMillan. Retrieved 2008-06-22. ↑ "Schultz, Dutch - The Free Information Society". Freeinfosociety.com. Retrieved 2010-12-28. ↑ "Dutch Schultz: Beer Baron of the Bronx — October 23, 1935 — Crime Library on truTV.com". Crimelibrary.com. 1935-10-23. Retrieved 2010-12-28. ↑ Guy Sterling, "Newark Approves Demolition of Building Where Gangster Was Slain". The Star Ledger, October 1, 2008.